Cape Dorset and its surrounding area is a landscape rich in history, culture and adventure. 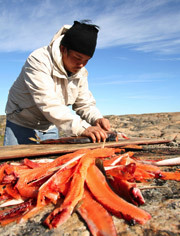 We offer cultural experiences, where an elder lights the quilliq and enlightens guests with tales of Inuit life and art. The elder is usually a renowned artist who shares stories of camp life, West Baffin history, and the West Baffin Eskimo Co-Operative. These events are highlighted with throatsinging, printmaking, carving and other Inuit art forms. Sweetening these evenings are social tea and desserts. You have access to several activities in spring, summer, and winter. There are a variety of adventures ranging from snowmobiling, nature viewing, fishing, to guided hiking tours around the area. Huit Huit Tours offers a variety of eco-culture trips in Cape Dorset and the south Baffin region. Inuit art and culture is a focus of town tours. We take visitors to live the culture with local people and learn about environmental adaptations on our “on-the-land” programs through hiking, camping, observing wildlife and viewing archaeological sites. We provide logistical and tour services to individuals, groups, film companies, divers and photographers. All-women groups and custom tours organized on request. For more information on Huit Huit Tours, please visit our website at www.capedorsettours.com.